The single has also reached the Top 10 on mainstream iTunes Charts in 16 countries, and is climbing the iTunes Rock Chart in the U.S. (#6) and UK (#8). 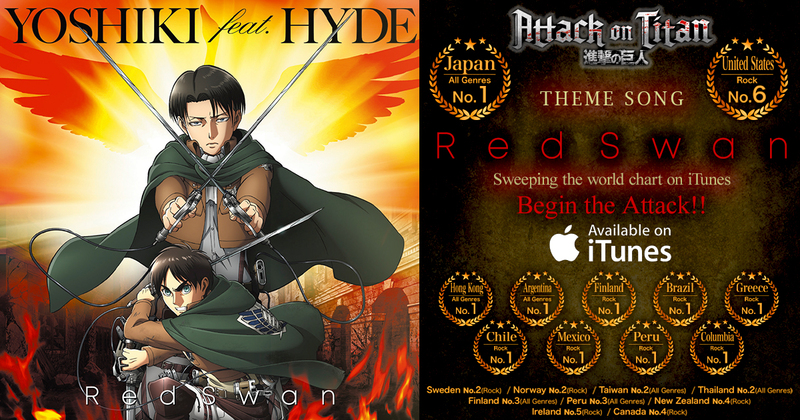 “Red Swan” is the first Japanese anime song in history to rank this high on iTunes Rock charts. Created by the leaders of the only two Japanese rock bands to headline USA’s Madison Square Garden — YOSHIKI (X Japan) & HYDE (L’arc-en-Ciel) — the song featuring mixed Japanese/English lyrics has received strong mainstream response. The Attack on Titan series is a worldwide phenomenon, and the success of “Red Swan” is further proof of Japanese anime’s popularity in the world of animation, next to Disney or Pixar, as well as Asian music’s growing popularity in the West (BTS, BABYMETAL). After the historic debut on the music charts, YOSHIKI and “Red Swan” caught the notice of CNN, MSN, and other mainstream news outlets.